I just received a set, and I'm not sure how the ball joint goes together? It's not already installed on the arm? The helm joint screws into the arm. the pinch bolt attaches to the hub where the original ball join attached then the 2 just go into each other. Its all in the directions.. I can only get them 3/4 of the way. Vise? What are you having an issue with? Screwing the heim joint into the arm or re-assembling the lock pin & pinch bolt? If you're having trouble screwing the heim joint into the arm, take the joint out completely and look at the threads in the arm. You don't want these cross threaded, it would be a very expensive mistake. I found that initially assembling the arms, I had problems screwing the heim joint into the arm. After inspecting the threads, it appeared to be that when CFM had the arms powder coated, they didn't close off the opening to the threads and a lot of gunk got in there. I cleaned it out as much as I could with a dremel + wire brush and some old gun cleaning gear I had laying around. Not many issues after that. Screwing the Heim joint in, I did notice it was dirty and blew it out. I'll try using the wire brush. Thanks for the photo this definitely helps with reassurance. Just to add, what I did was replace the nylock w/ 2 jam nuts (easier to pull a part if you need to)& I have 4.5 threads showing vs the 3 threads like they say. And for sure get the boots too. The boots are for the Heim joint? Do I need to grease the joint? I have 4.5 threads showing vs the 3 threads like they say. 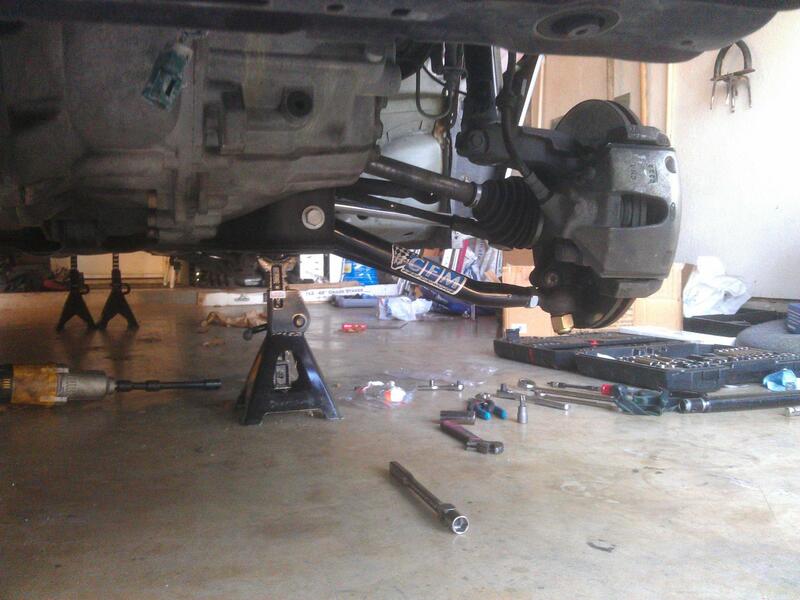 When I did mine and got it aligned the guy turned the joints a turn and a half out so im at 4.5 as well. I cleaned up the control arms where the joint screws in. I took me an hour to clean the treads on one control arm. There was alot of powder caked up on the inside. Goes together smooth now.